Sen. John Kennedy (R-LA) has come out against some of President Trump's judicial nominees as of late. He voted against Gregory Katsas for a seat on the D.C. Circuit Court of Appeals and is now signaling his intentions to vote against Brett Talley. Talley, nominated for a district court seat in Alabama, is guilty of a conflict of interest, Kennedy said, after learning the nominee is married to White House counsel Don McGahn’s chief of staff. In addition to that controversy, Kennedy argues Talley is just not qualified and he would vote against him "in a heartbeat." Kennedy has also withheld support from Kyle Duncan, nominated to the 5th U.S. Circuit Court of Appeals in New Orleans. Legal minds say Duncan has plenty of experience to serve and are urging Kennedy to get behind him. “President Trump continues to nominate exceptionally well-qualified candidates to the courts," Judicial Crisis Network's Chief Counsel and Policy Director Carrie Severino said in a statement. "Throughout his legal career, Kyle Duncan has been a champion in defending the Constitution and adhering to the law. His career has been a showcase for the types of judges the people of Louisiana and across the country voted for when they voted overwhelmingly for President Trump on the judges issue." 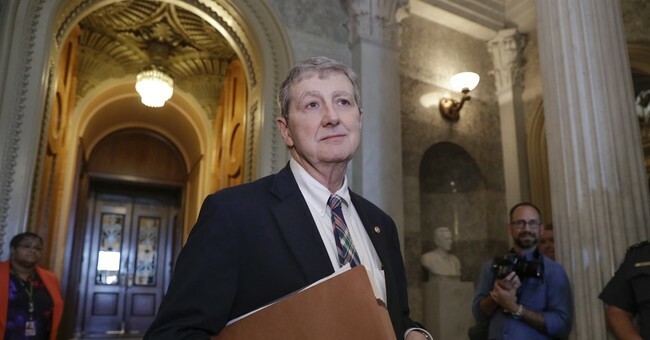 "The people of Louisiana are waiting to find out if Senator Kennedy stands with them and President Trump or liberal special interest groups in Washington," she added. Tea Party Patriots Citizen Fund Chairman Jenny Beth Martin issued her own statement in support of Duncan. Still, the Democrats get the prize for judicial stonewalling. For months, they have been refusing to hand in their blue slips or delaying votes. Frustrated Republicans have suggested changing Senate rules to limit debate time and streamline the process. One judicial nominee Democrats were not able to thwart was conservative Neil Gorsuch's confirmation to the Supreme Court. It is still considered by Republicans one of President Trump's greatest accomplishments his first year in office.